Trimingham is out in the north-east of Norfolk, where Poppyland becomes the caravan coast. I'm not being sniffy, incidentally - I love this part of Norfolk. There is something very old fashioned about the small resorts along this stretch of coastline, and that is exactly why people choose to go on holiday here. In July 2006, when we were visiting, they were being hugely rewarded with the warmest, driest summer in years. As I sit here in Ipswich in early August, writing this and watching the drizzle come down outside the window, I don't envy them. But I admire them. 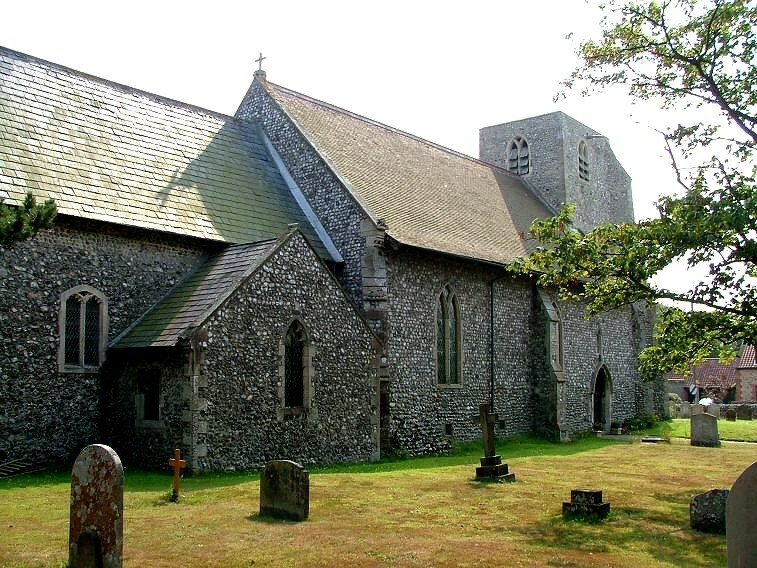 Those holiday-makers with a mind to visit old churches on a rainy day will also be rewarded, because in this pleasant corner of Norfolk they are virtually all open every day. 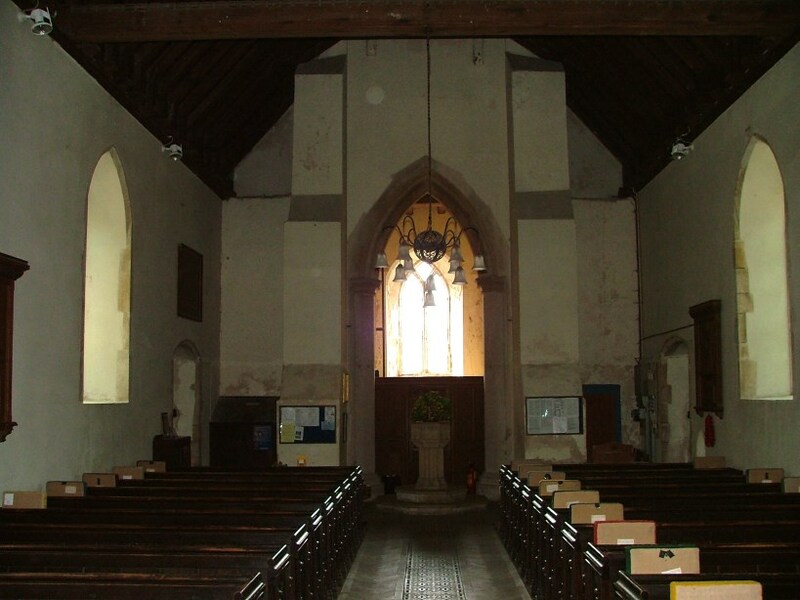 The aspect of Trimingham church is rather odd. The short, probably unfinished tower is heavily buttressed from the west, while the nave to the east cuts around it to embrace it. 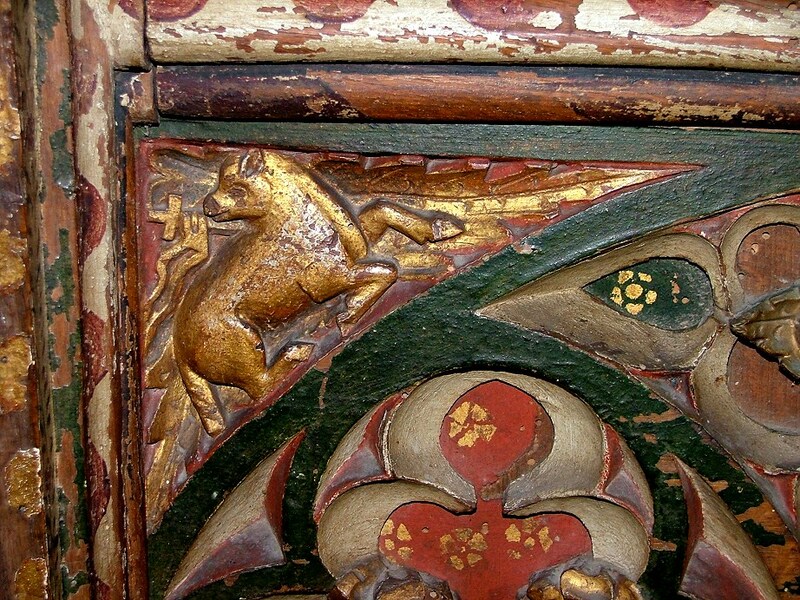 This peculiarity may be partly the result of a restoration by Thomas Jekyll in the 1850s. Pevsner feels that he almost completely rebuilt the nave. You step inside to a nave that is not exactly gloomy, but was in sharp contrast to the sunshine outside on the day we came. Perhaps the most notable feature is the way that the tower buttresses on the east side project into the nave. 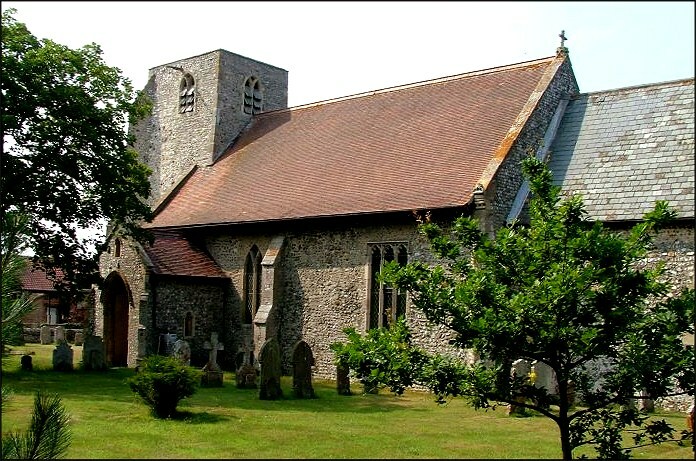 Trimingham church may not be the biggest or most magnificent of the churches in this area. 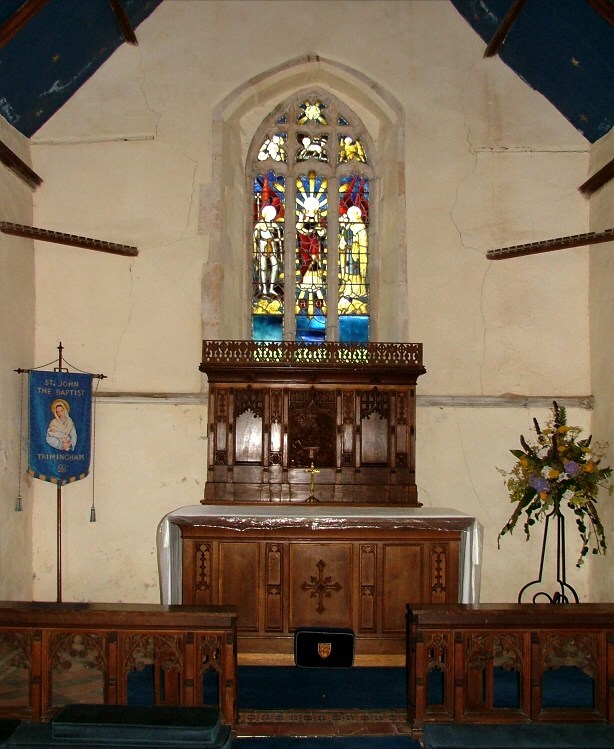 But it does have something that is shared with just two other churches in all England, its dedication. The other two are at Doddington in Kent and at Coln St Aldwyns in Gloucestershire. Now, there is no reason to think that the dedications of the majority of English parish churches are necessarily based on anything medieval. The very idea of a dedication was different in medieval times. 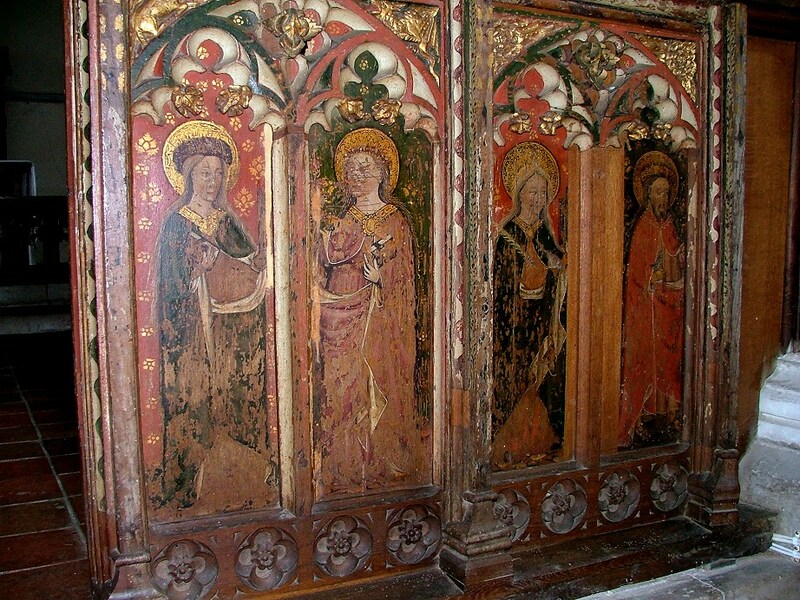 Churches were dedicated on, and to, feast days, not to Saints as such. The most common dedication in East Anglia nowadays is to St Mary, but this would not have been thought a proper dedication in medieval times. 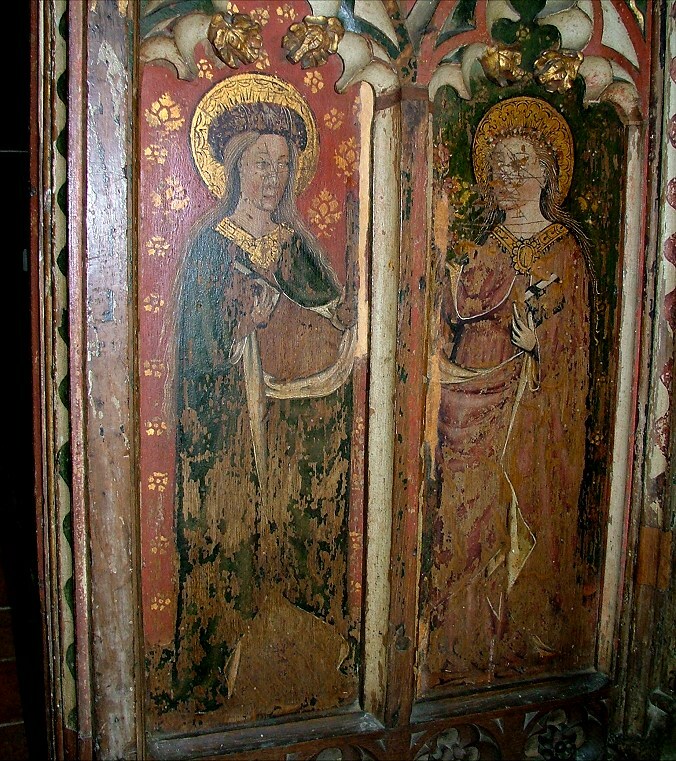 Rather, Marian dedications were to one of her feast days, and perhaps two hundred churches in East Anglia alone were dedicated to the feast of the Assumption by the end of the 15th century. Church dedications fell into disuse after the Reformation, except as a way of differentiating between one church and another, in towns for example. Many of the modern dedications of medieval churches are the result of well-meaning antiquarians delving through the records in the 18th century. They found wills and bequests to individual altars, and some churches had several of these. Since Marian doctrine was suspect to protestants, and the Church of England didn't recognise the doctrine of the Assumption in particular, those churches became St Mary, and so on. Some modern dedications are simply the result of exotic fancy by enthusiastic Anglo-catholic Rectors. 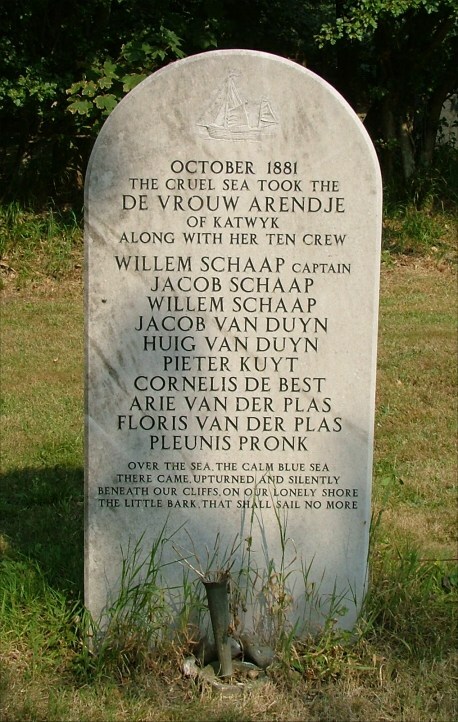 So how did this splendid dedication at Trimingham come about? In the late medieval period, there was a great devotion to St John the Baptist here. 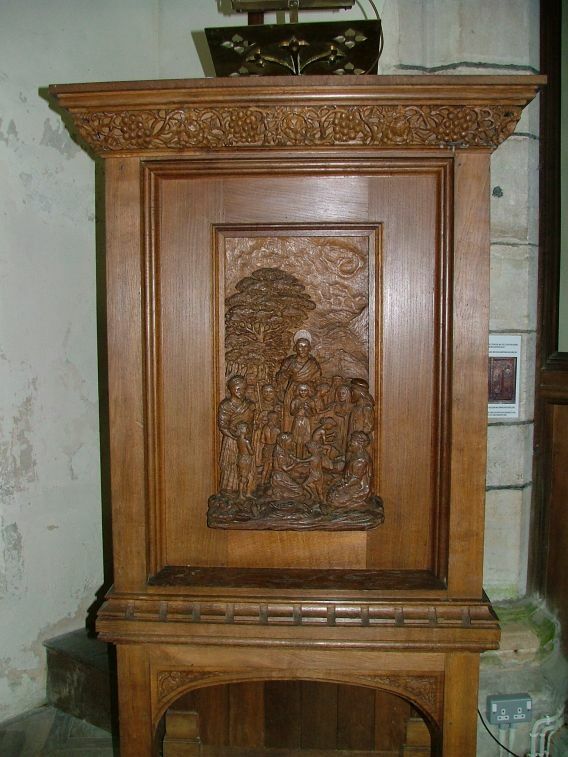 In fact, it was actually possible for English people to go and pray by the real head of the Baptist, as it was kept just across the channel at Amiens Cathedral; indeed, it was kept at at least two other European cathedrals as well. You can still see it at Amiens today. But rather than make that journey, it was possible to come and pray at the shrine altar here at Trimingham, where a life-sized alabaster carving of the head was on display. It so happens that one of these alabaster heads survives in the Victoria and Albert Museum. My friend Mark over at the Cambridgeshire Churches site photographed it recently, and you can see his photograph on the right - click on it to see it enlarged on flickr. Almost certainly, the image at Trimingham was exactly like this one. There is no suggestion that the church here was dedicated to the Baptist's head in the Middle Ages, but it would certainly have been the most memorable thing about the place. 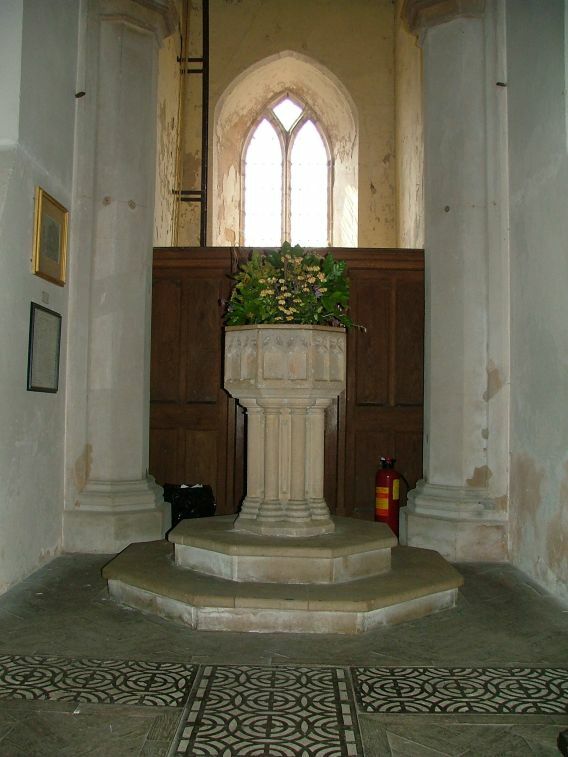 The head of St John the Baptist at Trimingham was probably destroyed by Anglican reformers as a result of the 1538 Injunction against images during the reign of Henry VIII. If not then, there was a further injunction which was rigorously imposed in 1547, during the early weeks of the reign of Edward VI. Even so, there is a small chance that the image limped on for a few more years, since Trimingham is a rather remote spot even today. Eventually, however, there would have been a visitation to ensure that the church had been cleansed. 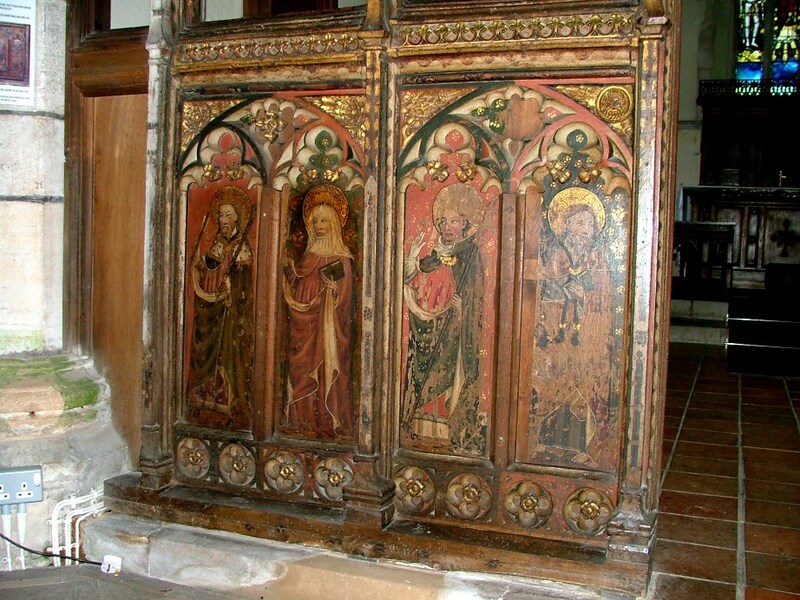 Eamonn Duffy, in his remarkable book The Stripping of the Altars, records that even as late as the early 1550s, officials were arriving at churches to discover that images had only just been removed. Drily, Duffy notes a few instances where the official question When did you destroy these images? was answered with As soon as we knew you were coming, which I like to imagine said in a broad Norfolk accent. There is no chance that any alabaster images in English churches survived to be destroyed by puritans a century later, as is sometimes suggested. The iconoclast WIlliam Dowsing, cleansing Cambridgeshire and Suffolk in 1644, kept meticulous notes, and does not record seeing a single image of a Saint in stone or alabaster. 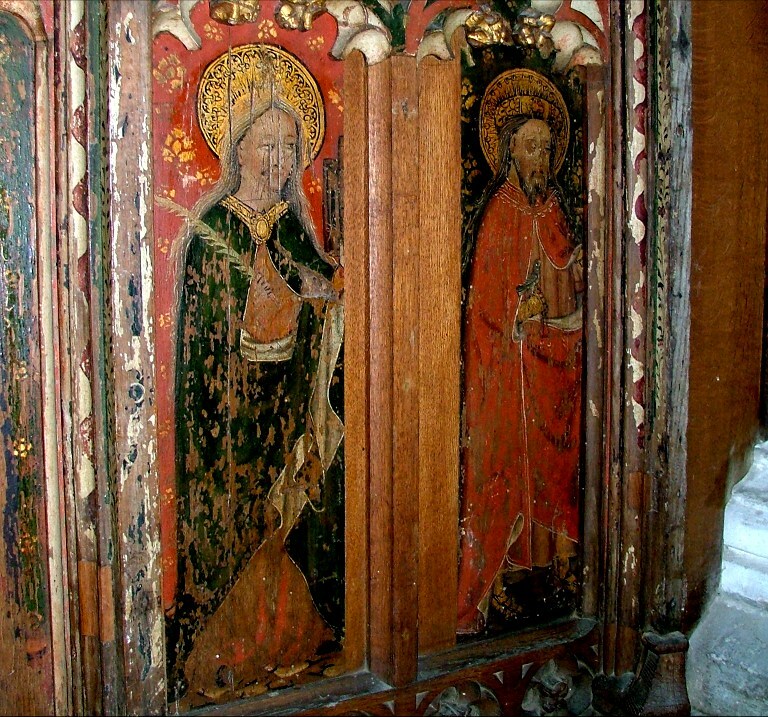 But evidence of the cult of St John the Baptist survives at Trimingham even today, and this, despite a fairly brutal restoration, is in the form of the rood screen. 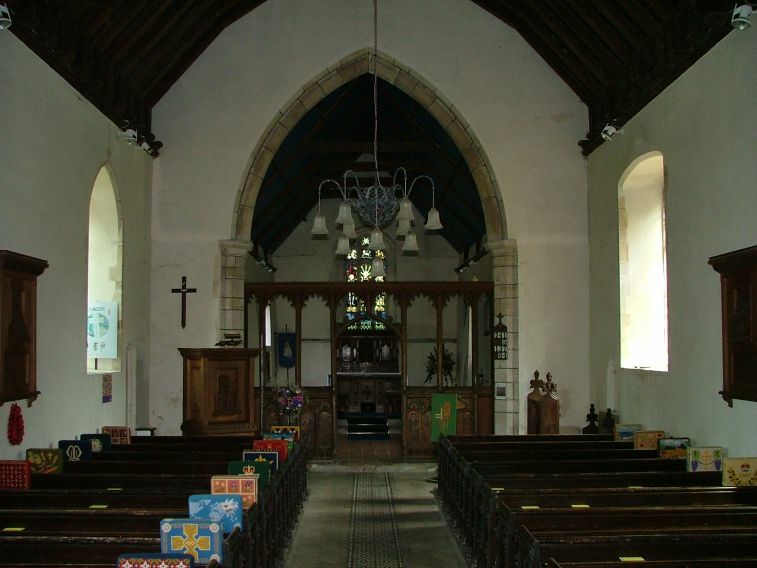 It is very small, with only four figures on either side of the entrance to the chancel. Who ever restored it replaced the uprights with wider ones, thus curtailing the edges of the panels. 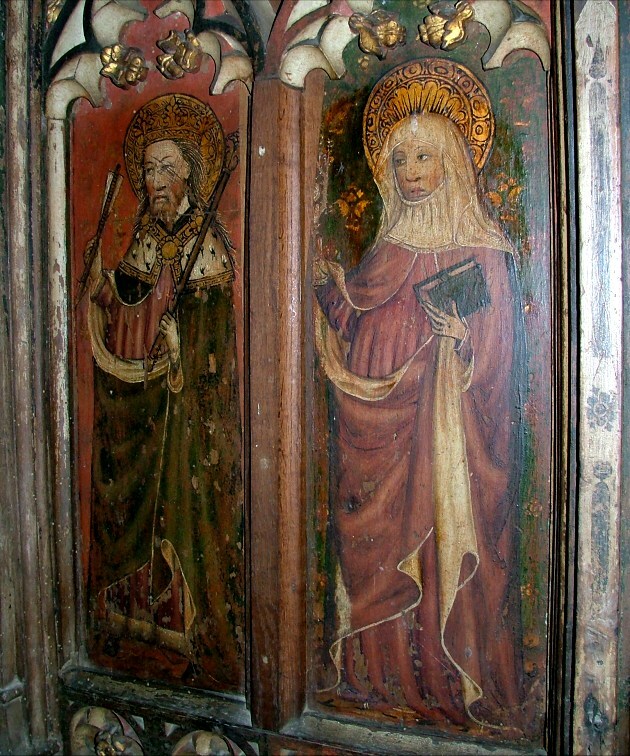 The eight figures, from left to right, are, on the north side, St Edmund with his arrow, St Clare with her book and monstrance, St Clement with his anchor and crozier, and St James in his pilgrim's robes. On the south side are St Petronella with her book and keys, St Cecilia with her garland of flowers, St Barbara with her tower, and St Jeron with his hawk. 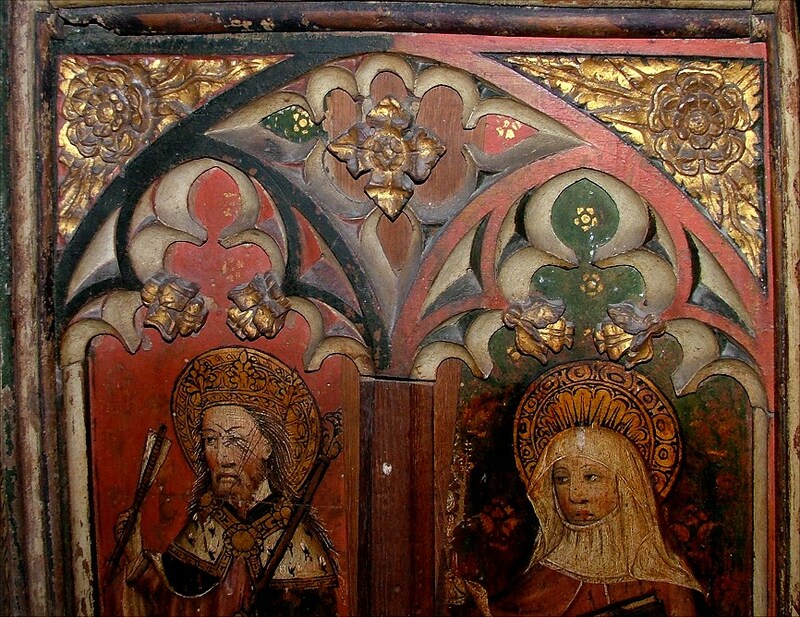 All these Saints are widely found on other Norfolk screens, but what makes the screen here remarkable is in the spandrels above the figure of St James. 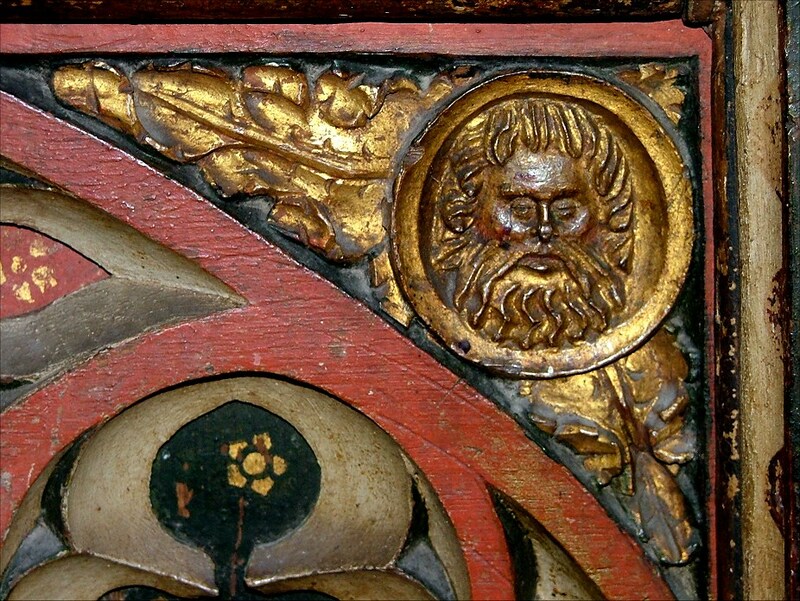 On one side is the Agnus Dei, the lamb and flag which John the Baptist is traditionally shown holding, and there, in the other spandrel, is the Baptist's head on a platter, as shown above left. 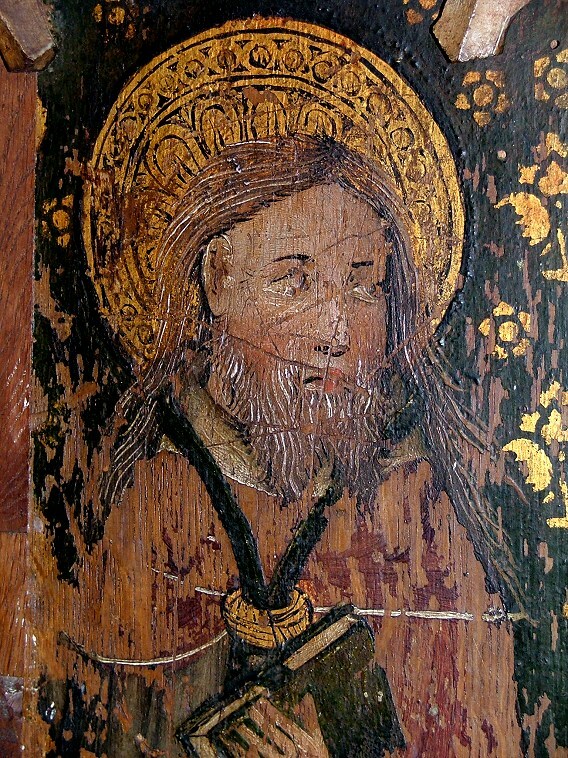 The figure of St James on the screen has been identified by various people as that of St John the Baptist himself, but it is, I think, St James. 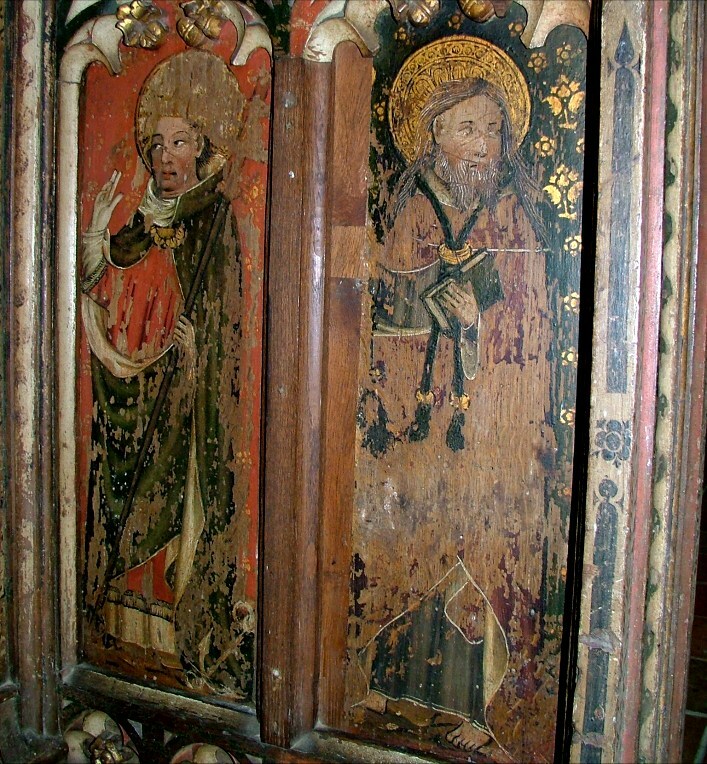 As I say, the screen has been brutally restored, and St James' staff has been destroyed in the process, but he is certainly wearing a pilgrim's cloak. Rather oddly, the church guide identifies St Jeron as a second St Edmund, but I think that this must just be a repetition of an editor's error in Mortlock. The east window is rather striking. Pevsner credits it to H Wilkinson, and dates it at 1925. 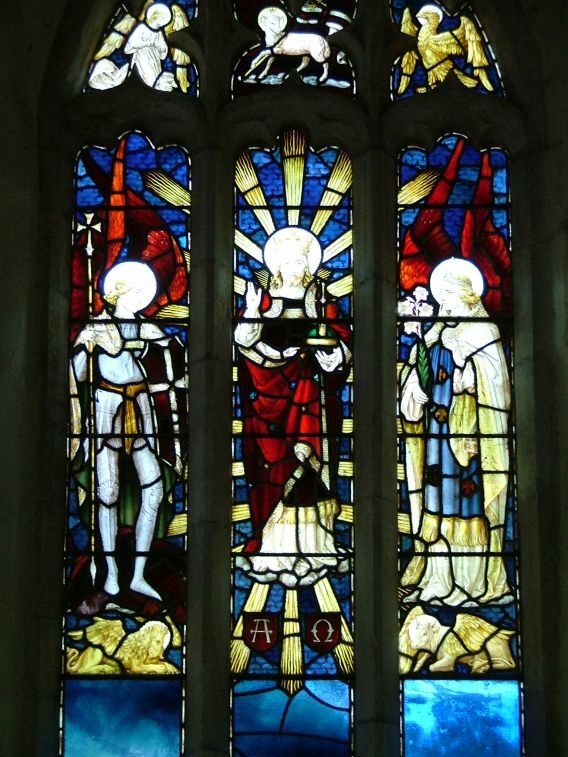 It depicts Christ in Majesty flanked by St Michael and St Gabriel, with the symbols of the four Evangelists surrounding them. St Michael, curiously, is given a shield with St George's cross on it. The window's deep reds and blues are magnificent, and it is perhaps the very height of Anglican triumphalism before the doubts started creeping in. 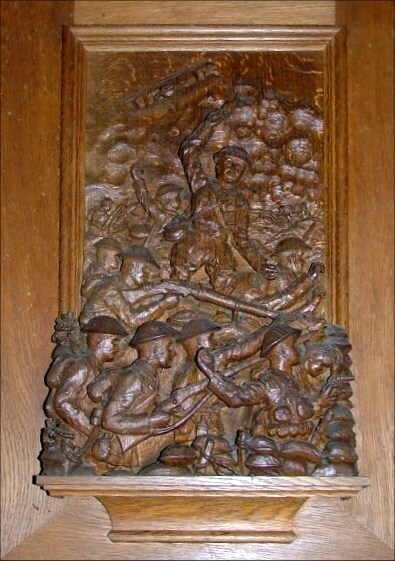 It is appropriate that Trimingham's medieval glory should be remembered in a carving, because in the years around the First World War, Trimingham had a noteable carving Rector, Reginald Page. You can see his work around the church: the pulpit is his, the war memorial is his; as are several other memorials, including his own, which we must assume he did in advance.